Mumbai, India—(27 April 2018)—Today, USGBC released the list of India’s Top 10 States for LEED, the world’s most widely used green building rating system. This is the first time the list has been released in India, and it ranks states in terms of gross square feet (GSF) of LEED-certified space overall. USGBC's LEED green building certification system is the foremost program for the design, construction, maintenance and operations of green buildings. More than 93,000 projects are currently participating in the commercial LEED rating systems, comprising more than 19.8 billion square feet of construction space in 167 countries and territories. In addition, more than 1.6 million are registered or certified with LEED. Learn more about LEED and review the Foundations of LEED development process. 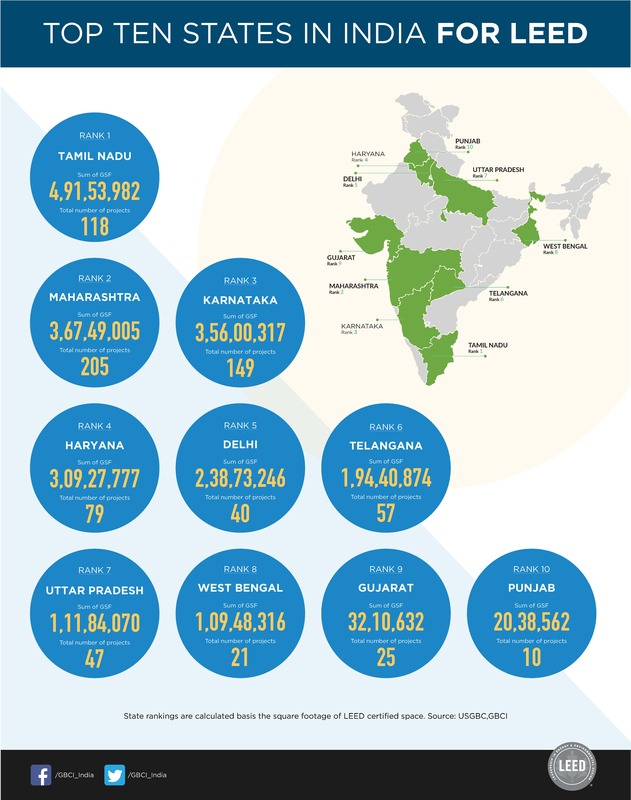 The Top 10 States for LEED were announced at the Greenbuild India 2018 cultivation event at the J.W. Marriott Sahar. Greenbuild, the world’s largest green building conference and expo platform, is coming to Mumbai Nov. 15–18, 2018. Learn more about Greenbuild India.